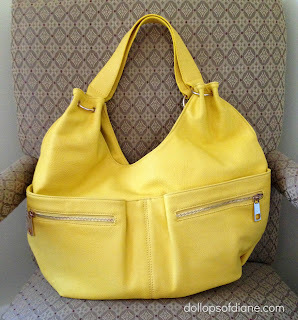 Dollops of Diane: A New Spring Bag! I happened to look at my bag the other day and noticed that it was in rough shape. How is it that you can carry around something every day and not notice the dirt and holes? So with the promise of spring in the air I went and picked up this new bad boy. It's totally not something that I usually would buy but I figure why not? After all, last week I never would have gone to a boot camp class and now look at me (Yup, I survived this morning, too!). Of course, since I bought the bag the temps have dropped back down to highs in the 30s but me and my bag will be all ready for when spring and summer come a knockin'!